Just the other day, we told you that Samsung had announced a delay in the launch of the Samsung Galaxy Tab 2 (7.0) and the Samsung Galaxy Tab 2 (10.1). A launch of the pair in the U.K. is now penciled in for late this month before the duo sees the light of day in other markets. 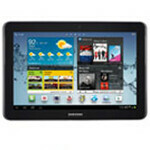 As we pointed out, a company spokesman blamed the delay on the need to make Android 4.0 run more smoothly on each tablet. Despite this logjam, Office Depot is apparently able to see the future. 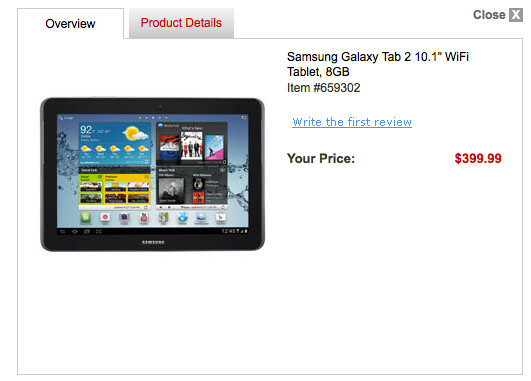 Earlier on Friday, the tablets section on the office supply retailer's website showed the Samsung Galaxy Tab 2 (10.1) priced at $399.99 for the 8GB model. There was no way that the model could have been checked out and paid for and by later in the day the tablet had been removed completely from the site. Does Office Depot know something that no one else does? Considering that the tablet was originally set to launch in March, it could have been a simple timing mistake. If the price is indeed correct, the Samsung Galaxy Tab 2 (10.1) is going to have some rough competition on the high-end from the new Apple iPad, which has twice the storage and is faster. On the low end, the Amazon Kindle Fire 2 could be launching around the same time that Samsung's model hits the States. yea, 400 is out of the ballpark. especially if the Note tablet is rocking a quadcore. This should be more like 250-300 at max for 8 gigs, unless it has expandable memory. that type of pricing reminds me of a fruit flavored company. i wont be buying anywhere near that price. $299 would have been a smarter price. Acer has their 8GB for $329. With competition like this, no wonder the iPad is selling so well. I would rather wait for a much cheaper Google tab. Where are all the quad core high res. tabs that were supposed to be out by now ? Android tab makers need to step their game up big time !